The Walt Disney Company now own 87.14% of Disneyland Paris with 682,640,292 shares in Euro Disney S.C.A. The Simplified Cash Tender Offer continues and The Walt Disney Company via their wholly-owned subsidiary The EDL Holding Company LLC purchased 538,450 Euro Disney S.C.A. shares on Tuesday 30 May 2017. The Walt Disney Company now own 87.14% of Disneyland Paris with 682,640,292 shares. Euro Disney S.C.A. has a total of 783,364,900 shares, and under the Offer TWDC is offering Disneyland Paris shareholders €2.00 per share. If TWDC reach an ownership level of 95% of the company, they are planning to apply to the French financial markets regulator L’Autorité des marchés financiers (AMF) for a mandatory take-over of Euro Disney S.CA. the owners and operators of Disneyland Paris. Shareholders have until 8 June 2017 to partake in the Offer. Due to the Bank Holiday in France last week there has been a delay in the publishing of the latest figures regarding the Simplified Cash Tender Offer on the L’Autorité des marchés financiers website. Therefore between 24 – 29 May 2017 TWDC have purchased 1,831,295 Euro Disney S.C.A. shares. The Walt Disney Company now own 87.07% of Disneyland Paris with 682,101,347 shares. Johnny Depp gets a Sneak-Preview of the refurbished Pirates of the Caribbean ride. 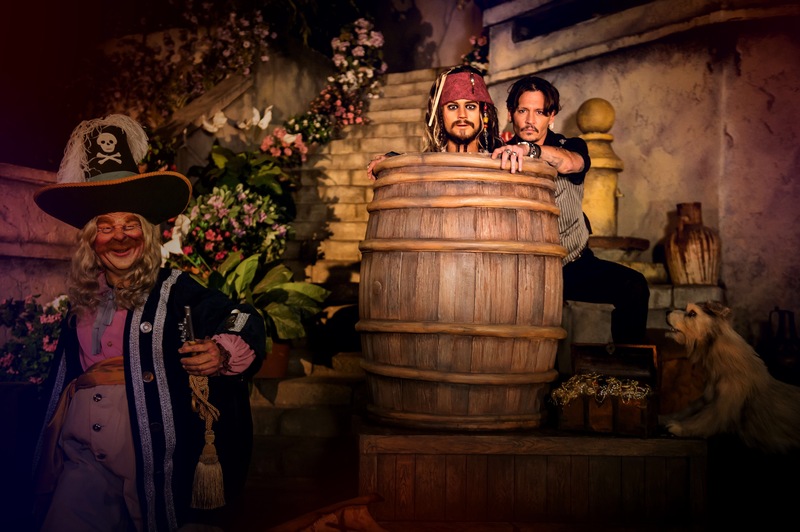 When the Pirates of the Caribbean: Salazar’s Revenge film team made a visit to Disneyland Paris recently Johnny Depp was the first to check out one of the new scenes in the Pirates of the Caribbean attraction that will reopen on 24 July. For the 25th Anniversary of Disneyland Paris the attraction is being overhauled and will be filled with new surprises. Want to catch a glimpse of the most sought-after pirate on the seven seas? You’re in luck because Jack Sparrow will be joining the adventure—you’ll find him in two scenes at the Adventureland attraction. 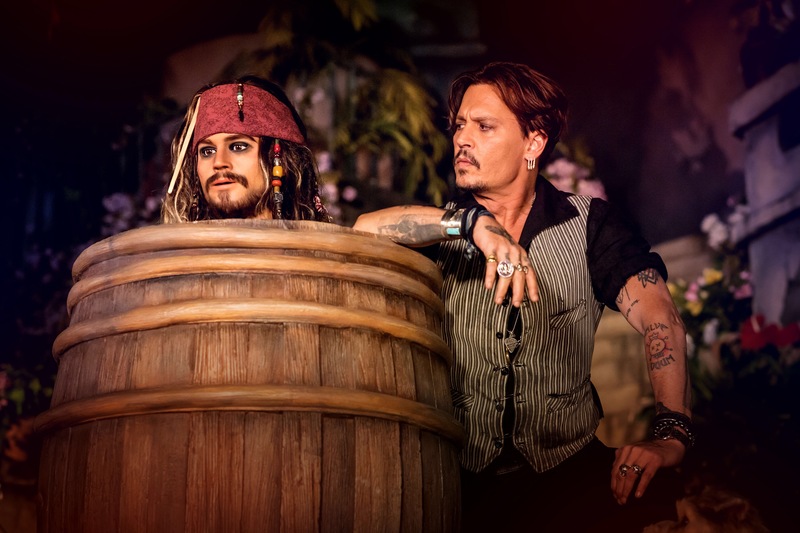 Johnny Depp explored these new scenes in the legendary Pirates of the Caribbean attraction himself when he visited Disneyland Paris. He struck a pose next to the pirate he knows so well, Jack Sparrow, who is hiding in a barrel, still searching for new treasures. The Pirates of the Caribbean attraction has always taken centre stage in the history of Disney Parks. Inaugurated in California in 1967, it has been part of Disneyland Paris since it opened in 1992. Supporting the ‘We Love Manchester Emergency Fund’. Like you, we were deeply shocked and saddened when we heard the news about the devastating terrorist attack in Manchester last Monday evening and our thoughts and condolences are with the family and friends of those who were killed or injured in the attack. The bomb at the Manchester Arena tragically killed 22 people and injured dozens more, many of them children. Manchester was the location of the Mouse Meets Disney fan conventions organised by our friends over on the Disney Brit Podcast, and we had a great time attending these conventions and exploring the city that hosted them. Following the attack we received a few messages from fellow Disneyland Paris shareholders to say that they will be donating the proceeds from the sale of their Euro Disney S.C.A. shares to The Walt Disney Company under the Cash Tender Offer to the We Love Manchester Emergency Fund. The We Love Manchester Emergency Fund, launched by Manchester City Council and the British Red Cross, will support those who have been injured or bereaved by the attack at the Manchester Arena. We have also decided to donate the proceeds we will be receiving from the sale of our shares to the Fund as well. If you are thinking of donating the proceeds from the sale of your Euro Disney shares to the Fund, please contact us, and if there is enough interest we will contact Disneyland Paris and The Walt Disney Company to see if they too would be interested in supporting our fund raising efforts by matching our donations. The squeezing out of Euro Disney Shareholders and a Campaign for Compensation. Jürgen Freisler has been a Euro Disney S.C.A. shareholder for more than 20 years, and with friends and relatives he has as a holding for approximately 30,000 shares in Disneyland Paris. Earlier this month Jürgen wrote an open-letter to the Alberta Investment Management Corporation (AIMCo) who hold a 4.37% stake in Euro Disney S.C.A. with 34,201,000 shares requesting them not to sell their stake in Disneyland Paris to The Walt Disney Company. With your almost 5% equity stake in Euro Disney (ED), you are now the only ones who are able all alone to prevent a takeover of ED by The Walt Disney Company (TWDC). I think it will be profitable on the long run not to sell but to keep the shares of ED. Only with your influence and powerful position it will be possible to prevent the “squeeze-out takeover” of ED by TWDC. Please help shareholders like me not to be “squeezed-out”. As many shareholders will know since the opening of Disneyland Paris, the management company (Euro Disney S.A.S.) owned by The Walt Disney Company (TWDC) has been unable to manage the parks in a manner to actually generate profits for Euro Disney. The lack of profit has always been blamed on the enormous debt the resort has. But as Jürgen and many other Euro Disney shareholders have come to realise other theme parks throughout Europe operate profitably and generate a healthy return for their owners and investors. Disneyland Paris grew bigger and bigger through investments while the value of it’s share price has decreased consistently. There were practically no profits reported, which were greater than the resorts reported depreciations. A cut in capital and the capital increase of 1994 in the ratio of 2:7, the 2nd capital increase of 2005 in the ratio of 5:13 and the conversion of shares in the ratio of 100:1 in 2007 and yet another recapitalisation and capital increase in 2015 which saw the shares slashed in value to €1.25 has made it impossible for any shareholder to get an overview of the entire deterioration of Euro Disney shares. Charts that cover such long periods are not found on the Internet. From 1992 to date, the share price has fluctuated between approximately €500.00 to €1.03. During the last 25 years, Euro Disney shareholders have lost more than 99% of their invested capital and this is in a renowned European company with a worldwide successful parent company. During all those years, Euro Disney has been presented as if it is short of being bankrupt. Jürgen believes that shareholders have sold their shares out of fear of losing everything and has led to a share price which has lost touch with reality. No attention was paid to any of the information Jürgen shared with Euro Disney and The Walt Disney Company about the disadvantage to shareholders in the 2014/2015 capital increases and restructuring measures. During the capital increase measures in 2004/2005, the stock company Euro Disney S.C.A. had to assign 18% of its assets to subsidiaries of TWDC in exchange of a debt relief worth a mere € 308.1 million. Shareholders hold only 82% of the shares of Euro Disney Associés S.C.A., which was newly established just for this purpose. Back then, the total value of the company was assessed at approx. € 1.712 million, which Jürgen and many other shareholders including French hedge fund Charity & Investment Merger Arbitrage Fund (CIAM) believe was much too low. All shareholders including the EDL Holding Company LLC owned by TWDC were disadvantaged by the transaction. Whereby these disadvantages had thus far no negative effects because no dividends have ever been paid to Euro Disney shareholders. Therefore Jürgen Freisler has launched a campaign for compensation for Euro Disney shareholders. In a letter he has sent to fellow Euro Disney shareholders Jürgen explains that the external financial advisers of The Walt Disney Company and Euro Disney have succeeded to develop, and to strategically introduce a refined business concept for the benefit of their customers – the parent group TWDC and the subsidiary company Euro Disney. But the shareholders of Euro Disney are the ones to suffer he explains, who on the one hand had to face losses amounting to billions of Euros due to the price decline of the shares (up to 99% of the invested capital) and on the other hand lost up to 93.3% of their real assets alone by the practised expropriation strategy. In the letters published on Jürgen Freisler’s website www.dia-spezial.de you can read how according to Jürgen this occurred. Jürgen discusses in his letter to shareholders how TWDC has written off debts from Euro Disney amounting €809.1 million and for that measure the shareholders of Euro Disney had to deliver 54.7% of their company to TWDC. Jürgen Freisler believes that this was by far too much since the real value of the company was placed into account so ridiculously low that it only corresponded to the amount of the whole debts. A complete debt relief would have resulted immediately in an expropriation of all shareholders and they would have realised this measure. By delivering 54.7% of their real assets shareholders had to suffer “only” a €1.2 billion loss of property. Now TWDC wants to take over the remainder of Euro Disney for €2 per share via The Simplified Cash Tender Offer even though Mr Freisler has calculated shares in Euro Disney are worth at least €7.66. Jürgen’s goal is to prevent a court dispute. Therefore Jürgen is trying to achieve a settlement out of court based upon his explanations in his letter (in German) to Catherine Powell, Président of Euro Disney S.A.S dated 24 March 2017. 2. The shareholders who had shares with subscription rights in 2014/2015 shall receive “free shares” from TWDC to compensate for their real asset losses. To reach a common consent about the number of “free shares” a joint meeting should take place with representatives of: Morgan Stanley, TWDC, Euro Disney, the supervisory board of ED, the office LEDOUBLE, the shareholders concerned like e.g. Prince Alwaleed and Jürgen Freisler as a representative of other shareholders. The chance to achieve the above goal is only possible with the support of other Euro Disney shareholders, with the publication of his letters which were sent to CEO’s of TWDC and Euro Disney and under public pressure. If you are affected and if you want to get further information or if you have proposals please send Jürgen Freisler a message and visit his website www.dia-spezial.de where you can read the letters listed in his letter. If no out of court settlement can be achieved he would like to co-finance the best possible lawyer available for shareholders. If you want to support Jürgen Freisler’s effort to achieve an out-of-court settlement with TWDC with the goal that those shareholders who owned shares in 2015 with subscription rights prior to the capital measures are compensated please return this letter to him. The Simplified Cash Tender Offer continues and The Walt Disney Company via their wholly-owned subsidiary The EDL Holding Company LLC purchased 462,916 Euro Disney S.C.A. shares on Tuesday 24 May 2017. The Walt Disney Company now own 86.83% of Disneyland Paris with 680,270,052 shares. The Simplified Cash Tender Offer continues and The Walt Disney Company via their wholly-owned subsidiary The EDL Holding Company LLC purchased 18,284 Euro Disney S.C.A. shares on Monday 23 May 2017. The Walt Disney Company now own 86.78% of Disneyland Paris with 679,807,136 shares. TWDC require a further 8.22% before they can apply for a takeover.